Home › Projects › Home Haunting › Crafts and DIY › In a Pumpkin-Shell Coach: Grow Now for Halloween! In a Pumpkin-Shell Coach: Grow Now for Halloween! Darlings, have you ever considered growing your own pumpkins for Halloween? They are a marvelously easy and fun addition to your garden, and with this weekend marking 110 days until Halloween, now is the time to start growing! Pick a sunny spot. Pumpkins love sun and need as much as 6 hours of good sunlight daily. Water regularly. 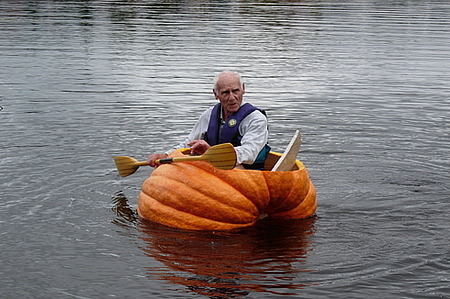 Pumpkins are nearly 90% water, so they need regular drinks to get big. Let the soil dry out between waterings, then give them a careful soak. If possible, water only at the start of the day and at the base of the plant (avoid soaking the leaves and fruit) to help prevent powdery mildew. Hand pollinate. Part of the magic of growing pumpkins is the beautiful orange-yellow flowers they grow from. The flowers are distinctly male and female, rise in a day, slowly unfurl as a bright banner for pollination for a few hours, then close up and start to die that night. Pollination is key to making big, robust pumpkins, and since the female flowers are only available to pollinate for a day or so, I like to pollinate them by hand (using a paint brush or q-tip) to help things along. You can also use the technique in the video below. Just (ahem) try not to blush, kittens. Here are a few shots of my little sproutlings from last year as they work their way towards Halloween. These things grow like crazy, so it’s a delight to check their progress every day as they literally grow before your eyes. Good luck, and happy gardening! Not sure where you’re located, but Marshall’s sells a variety. When my pumpkins started growing, I had no idea what they were. I thought they were some kind of strange burdock, and I tried yanking them up. Unable to yank them up. I called to my hubby who informed me that we had pumpkins. What a nice surprise! What luck! I seem to have the opposite ability with plants…it’s rather a surprise when they survive!